Another reason I am so proud of NOW's work against Walmart. V-Day expresses its strong support for the workers in Bangladesh killed when a building, housing several garment factories manufacturing clothing for American and European companies, collapsed on April 25th. The collapse of Rana Plaza building in Savar, an industrial suburb of Dhaka, has killed over 300 people to date, mostly young women workers - and has injured over 2,000 - with the death toll rising by the hour. Huge cracks had been found in the building, and workers refused to go into the building to work, but were forced by the garment factory owners who threatened non-payment of one month's wages if the workers didn't comply. According to Khushi Kabir, a women's rights activist and One Billion Rising coordinator for Bangladesh - "I am so sick of the unnecessary murder of the workers, most of whom are women. This is not the first time garment owners have shown such callousness, nor the first time such tragedies have occurred. Despite High Court orders, no actions seem to have been put in place." V-Day has created THE RISING FUND, which will provide immediate emergency support for workers and their families. All funds raised will go directly to the medical and financial support of the families of the workers who lost their lives, and to the medical needs of the workers who were injured. Frequent Fox News contributor Erik Rush got into a Twitter exchange shortly after yesterday's apparent bombing to declare of Muslims: "Yes, they're evil. Let's kill them all." Rush is only one of many right-wing commentators to jump to the immediate conclusion that the tragic explosions at the Boston Marathon were the result of Islamic terrorism, but his "Kill them all" comment is so far over the line that Fox must distance itself from Rush's violent bigotry. Demand that Fox News have no more contributions on "news programs" from extreme bigot Erik Rush. Our thoughts and prayers remain with the victims of yesterday's violence and their families. It's a shame that we need to respond to such hate the very next day, but we do -- Rush's brand of bigotry must be called out and answered. Take action now by telling Fox News to keep Erik Rush off the air. Erik Rush is a WorldNetDaily columnist and, frankly, this is the kind of thing one would expect from a prominent voice on that site, which is a festering cesspool of right-wing bigotry and fringe conspiracy theories. But Fox News, albeit known for its right-wing bent, is a major news outlet and when it gives a podium to a hatemonger like Rush it legitimizes him and his views. While the First Amendment protects Rush's right to spout whatever venomous hate speech he wants, it doesn't guarantee him a spot on a major news network. Rush has a right to say what he wants, but the public has the right to be outraged and demand action from one of his outlets. Fox News must be held accountable for any further association with Erik Rush. Tell Fox News: No more contributions, on TV or online, from hatemonger Erik Rush. After PFAW's Right Wing Watch called much attention to Rush's tweet yesterday, Rush responded with a non-apology on Twitter saying that liberals' "precious Islamists say the same ['kill them all'] about us EVERY DAY," and tried to play off his original comment as a type of "sarcasm." Speak up! No one should, especially in the immediate aftermath, be exploiting a tragedy like yesterday's to advance a hateful agenda of bigotry and fear. The National Organization for Women is proud to announce its support of The Inclusive Prosperity Act, a financial transaction tax introduced today by Rep. Keith Ellison, D-Minn. The Ellison bill would create a Wall Street sales tax, providing hundreds of billions of dollars in revenue every year for such critical needs as jobs, health care, education, housing assistance for low-income individuals, and expanding and improving the social safety net. "It's about time Wall Street started paying its fair share," said NOW President Terry O'Neill. "The people of this country are still struggling to get by, six years after the economic downturn began. 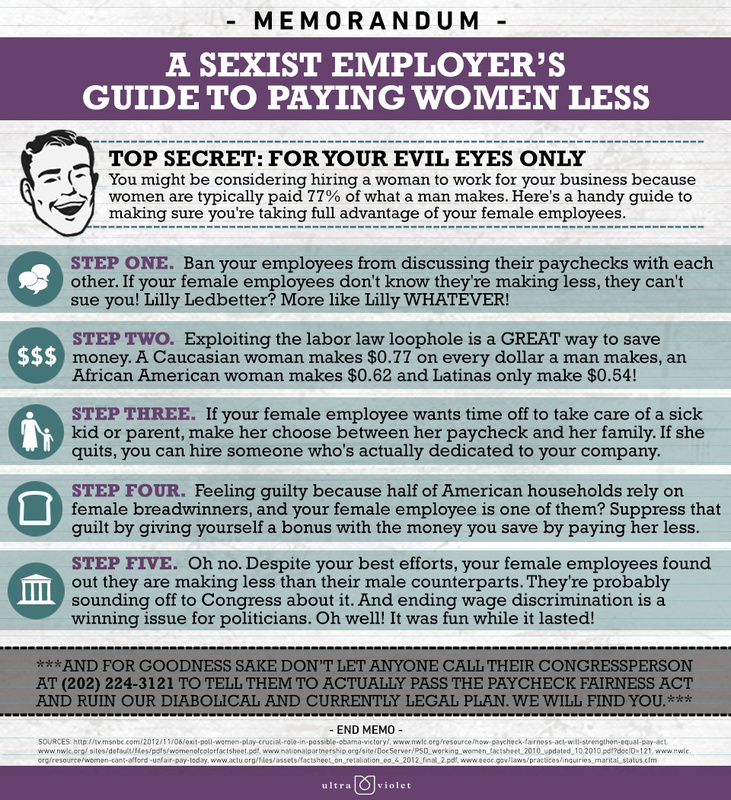 Women are disproportionately represented amongst the poor and those working for minimum wage with little to no benefits. We need a strong safety net, and who better to pay for it than the financial institutions that caused the economic crisis in the first place?" The bill would allow the U.S. to join the rest of the world in a growing system of financial transaction taxes. The recent adoption of a similar tax by 11 European countries -- a tax that will apply to U.S. traders whose payments will fund European priorities -- shows the proposal has momentum and substantial international support. NOW activists will join the Robin Hood Tax Campaign on Saturday, April 20, for a rally outside the International Monetary Fund and World Bank offices, and then a march to the White House and U.S. Treasury Department. In addition to NOW, more than 140 organizations representing millions of members have endorsed passage of the Wall Street sales tax. "The growing wealth and income gap in this nation is syphoning money away from the U.S. government and the programs it funds," said O'Neill. "The Robin Hood Tax is an important step in returning this money to the people." Please see below accolades from NOW leaders. "Talia is a great feminist. Such exciting news!" "Wow! Friends: I'm so excited. As some of you may know, I have been mentoring for a year or so a 17-year-old Modern Orthodox feminist woman, Talia Weisberg, who is slated to start Harvard this fall. Talia, whom I've never met, is a brilliant young woman, a writer, who plans to go to law school. Through my connecting her up with NOW and NOW's generosity, she attended the NOW annual conference some time ago. She just sent me the following email:"
I just found out that I was named one of the Jewish Week's 36 Under 36 for 2013!!! I'm sure you're familiar with it, but if you're not, this is the biggest honor that can be accorded to anyone under the age of 36 in the Jewish community. A family friend nominated me and I thought I didn't stand a chance - I'm still not even sure why I tried - but I was just informed that I am part of the 36! I still can't believe it. I feel so honored and privileged to be part of such an elite few, which includes some of my sheroes. I thought you'd like to know. We are sponsoring the following event by Paradigm Shift. Hope you can attend. APRIL IS SEXUAL ASSAULT AWARENESS and PREVENTION MONTH !! Tue, Apr 23: Lobby for Governor Cuomo's Women's Equality Act! Jezebel wrote about this, also. 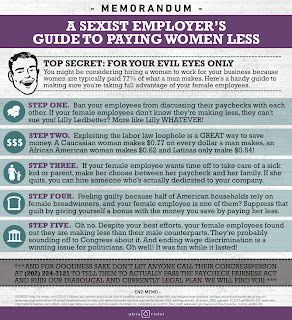 Ultraviolet's "Sexist Employer's Guide To Paying Women Less"
Jerin will be speaking at the following event at 2pm. Hope you can join us. 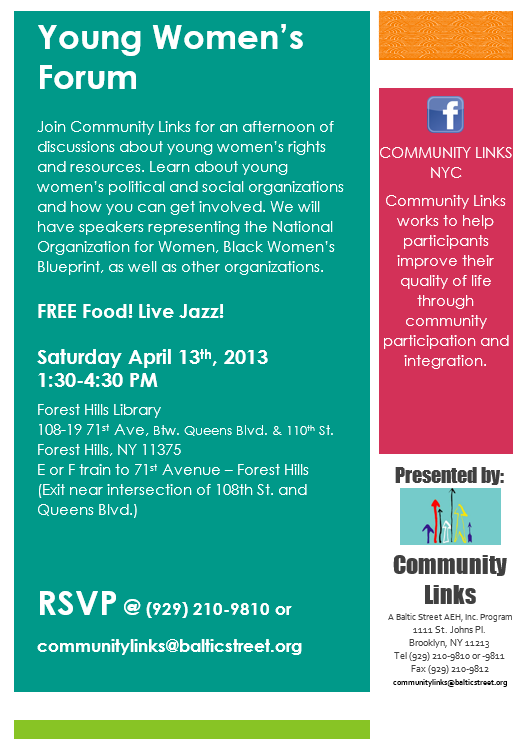 Join Community Links for an afternoon of discussions about young women's rights and resources. Learn about young women's political and social organizations and how you can get involved. We will have speakers representing the National Organization for Women, Black Women's Blueprint, as well as other organizations. We invite all young adults (18-25 year old's) to our second free event at Forest Hills Library 108-19 71st Ave. Forest Hills, NY 11375. This event will be in the auditorium. There will be music and free food. 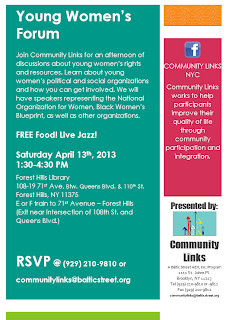 The informative event will present various empowerment resources.